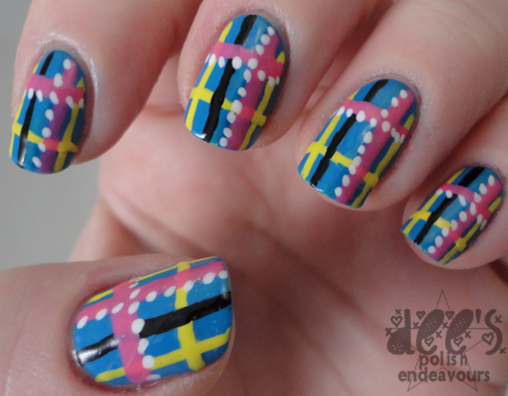 As promised, I bring you the photo tutorial for my colourful plaid nails.. I apologize in advance.. while taking the photos, I only snapped ONE photo of each step. I never only photograph my nails once.. so I have no idea why I thought one photo of every step would suffice. I FAIL! But. Despite some of the fuzziness of the photos, I think you will all be able to understand what to do. Just a reminder of what we are doing..
You don't have to use the exact same colours I used.. You can use any colours you have on hand, or colours that you love having together. 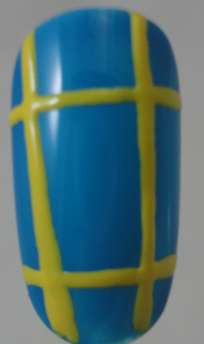 I knew that I wanted to use the blue and pink from Pop Art and decided to go with another bright and contrasting colour, which is why I chose yellow. I also added the black and white as colours that sort of tie the whole look together. For even more fun, just use all different colours rather than play it safe with shades. Start with your base colour. 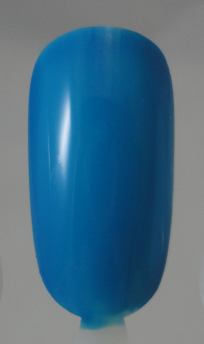 I used the blue side from Revlon Pop Art. Then add four lines with your next colour. 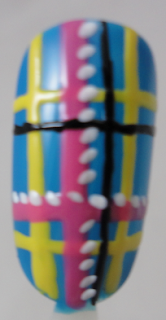 I used Zoya Pippa. 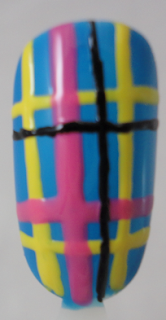 Next add two lines, one in the middle of the nail, and then one intersecting just below the "middle" of your nail. I used the pink side from Revlon Pop Art. Next we are basically doing the same step as last time. 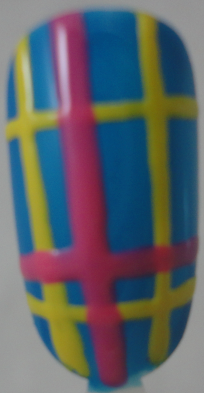 A thinner line just off of the middle of the nail, with a line intersecting just above the "middle" of your nail. I used Orly Liquid Vinyl. Last step is adding some white "flick dots", they aren't quite dots, and they aren't quite lines.. they are.. flicks! I add them across the pink lines, and I used Orly White Out. I hope this has been somewhat educational.. and that you give this look a try! If you do, I would love to see them! Have fun - and I will see you all again soon! !